"Bringing you fresh local produce at affordable prices"
We’ve got a market of seasonal merriment kicking off with the local River Hundred Folk Band playing from 9am this Saturday. Its the perfect time to restock the pantry and pre-order your traditionally reared Turkey at our final* (full) market of the year. With a whopping 36 stalls it will be your best chance to pick up those unique handmade gifts and Christmas treats. As well as a variety of craft stalls, wood turners, and speciality soaps, we will have our normal food stalls, from meats (including game & venison) to fresh and smoked fish, terrines and parfait, vegetables, apples and juice. 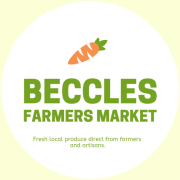 There’s also raw milk, free-range eggs and goats cheese, and don’t forget your local ales, lacto and gluten free baking, home-made jams and marmalade, pickles, chocolate brownies, flapjacks, Belgian truffles and fudge. This market only we’ll also be joined by the Armstrong family, who’s daughter Izzy has learnt to weld to recycle old horseshoes into unique Christmas decorations. – A must see! Yet again, one lucky supporter will be walking away with a £30 hamper of market prizes in our special 50p raffle (surplus profits will be used to support market promotion). Get your Christmas orders in for this Saturday!